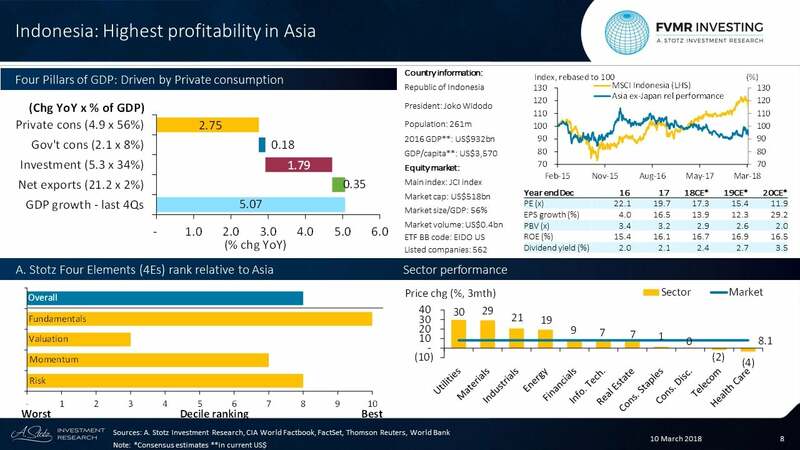 Indonesia has good GDP growth, driven mainly by private consumption and secondly investments. Government consumption contributed the least to GDP growth in the past four quarters. Indonesia has had, and consensus expectations are, that the country should continue to have the highest ROE in Asia. This is also reflected in the valuation, Indonesia’s 2018CE* 2.9x PB is the highest in Asia ex Japan. Overall, Indonesia appears third most attractive in Asia considering all our four elements: Fundamentals, Valuation, Momentum, and Risk. Fundamentals: Indonesia has the highest ROE in Asia. Valuation: This strong profitability is reflected in the highest PB in Asia. Momentum: Good price and earnings momentum. Risk: Relatively low volatility and low beta to Asia ex Japan. Top 3 largest sectors: Financials: 31% of the market; Consumer Staples: 23%; Consumer Discretionary: 10%. Worst sector & stock: Health Care: -3.7% & PT Kalbe Farma Tbk: -11.9%.